Having a clean home is important to me because I want others to feel comfortable and at-ease in my house. I want my humble abode to be a place of peace, rest, safety and joy. Time. I don’t have endless hours to spend cleaning my home…And I’m sure you feel the same way! I need a realistic house cleaning routine and fast-acting cleaners. Money. Similar to time, I don’t have an endless supply of money…And I bet you don’t have a money tree growing in your yard either! I need budget-friendly cleaning products and supplies. Ingredients. I don’t want to fill my home with harsh, harmful chemicals…And you probably want to avoid those ingredients as well! I need safe cleaners that will not hurt my family members, pets or furniture. Results. Obviously I want to see that my efforts are actually producing positive results (aka – a sparkling, clean home! )…And I know that you want a clean house as well. I need cleaners that will actually clean my house without taking excessive money, time, or unnecessary ingredients. Guess what?!? There is a realistic method to cleaning your home that aligns with all 4 of those elements! An All-Natural DIY Multi-Purpose Cleaning Spray! I especially love using this all-natural DIY multi-purpose spay on my kitchen counters, tile floors, and door handles. The citrus smell leaves everything smelling as clean as it looks! I’m also amazed at how well this cleans my outdoor dining table; all of the dirt and nature comes of with a simple spray and a few swipes. 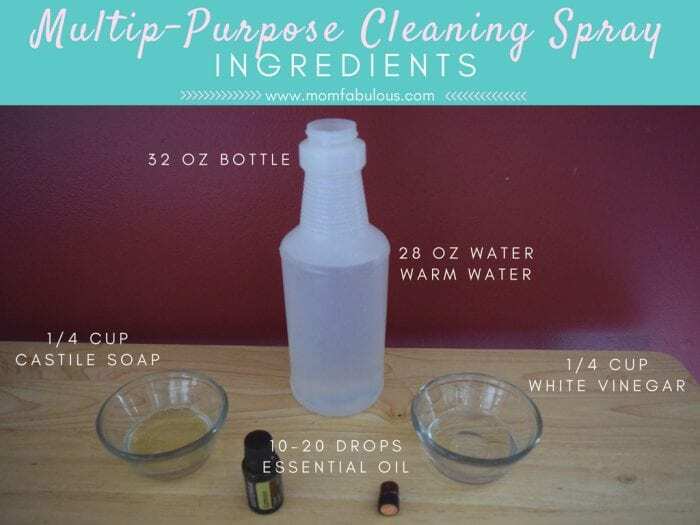 This All-Natural DIY Multi-Purpose Cleaning Spray recipe will make one 32oz spray bottle. Allow 5 minutes to gather supplies and combine ingredients. After 3 easy steps, you’ll have a family-friendly, hard-working, good-smelling spray! Tip: Buy a decent spray bottle from The Dollar Store. Or thoroughly wash out a spray bottle from another cleaner, such as a glass cleaner or a countertop spray, with hot water and mild soap. Be sure to remove the label or tape a new one on top so it is clear what chemicals are in the bottle. Tip: Tea Tree essential oil is a natural disinfecting agent, which makes it an excellent addition to your cleaner! Add in the vinegar, Castile soap and essential oil. Put on the lid and thoroughly shake to mix ingredients. Simply spray over desired area, then gently scrub with a few passes of a rag, paper towel, or mop. Tip: I love to use this spray on my floors with this kind of mop! For tougher or caked on spots, spray and allow to sit for 1-2 minutes before scrubbing again. If needed, spray and sprinkle baking soda over the spot, allow to sit for 1-2 minutes, and then try scrubbing again. The multi-purpose spray can be used on the following areas: kitchen sinks and countertops, bathroom sinks and countertops, sinks, toilet seats, hard floors, doors, trim, doorhandles, light switches, appliances, patio furniture. Test an inconspicuous spot before using on wood furniture, carpets, mirrors, or other delicate materials. Mondays – Bathrooms: Clean bathroom counters, sinks, mirrors, toilets. Clean the shower every other Monday. *You can clean the bathroom with the All-Natural DIY Multi-Purpose Cleaning Spray! Tuesdays – Dust and Vacuum Carpets: Dust the whole house. Vacuum carpets. Wednesdays – Vacuum and Mop Hard Floors: Vacuum all hard floors (wood, laminate, tile, etc.). Then mop all hard floors. Don’t forget to wipe down base boards as you mop. 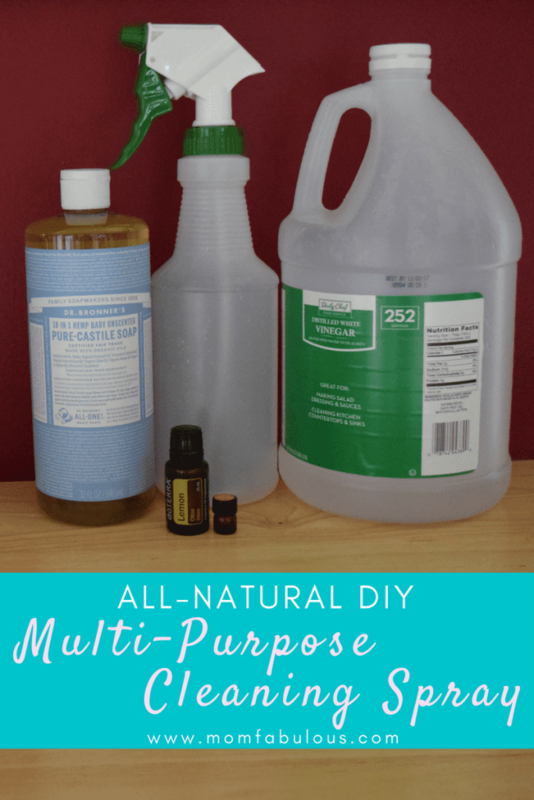 *You can mop floors with the All-Natural DIY Multi-Purpose Cleaning Spray! Thursdays – Random Chore: Deep clean various areas of the house. This includes: dust ceiling fans and light fixtures, clean light switches and doorknobs, deep clean appliances like the microwave and refrigerator, organize pantry or freezer, put out/take down seasonal decorations, etc. Fridays – Change Linens: Change all towels and sheets. Refresh table cloths and cloth napkins. Beat out rugs if necessary. Saturdays – Big House Projects: This is the day to tackle big projects (that often require help from the hubby). Painting walls, building furniture, resealing floors, hanging decorations on the walls, etc. Or have friends come over to your house. Sundays – Rest: Rest, because you worked hard this week! 🙂 Invite someone over to your home.